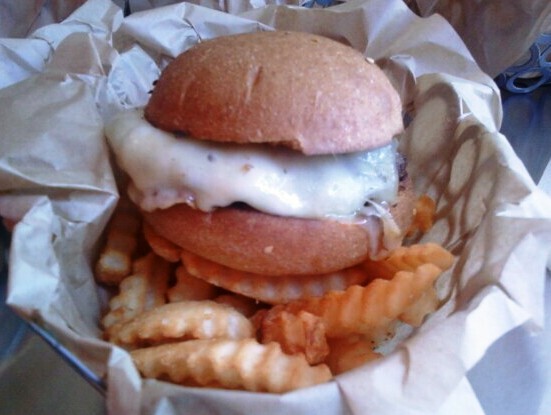 "...O!burger is the first burger joint in the Los Angeles area serving only !00% certified organic food. We aspire to make a delicious burger that leaves you satisfied without feeling stuffed!..." Pro Tip: "without feeling stuffed!" is code for small, overpriced portions. Ready...Set...Terrible! After ordering from the brain dead counter person, we sat down in the 16-seat establishment and waited for our $17/person food to arrive. An extra buck for cheese...dicks. The Beef: Certified Organic, Grass Fed, blah, blah, blah--it was the beef version of a Prius, OK? It tasted aged, and that was the sole positive note. 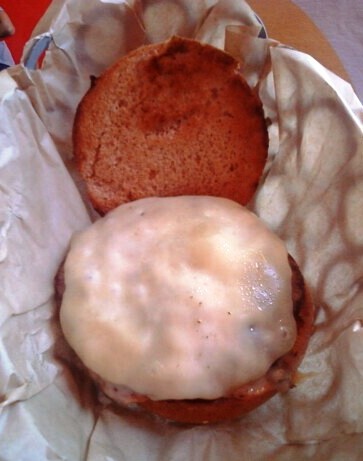 The patty was thin, rubbery, and dry--it was like eating a non-lubricated condom. Clearly, it had clearly been frozen for a good long while before it reached the griddle. The Sear: The sear was OK. Again, it was a very thin patty, so a decent sear was not an option. Seasoning: A little salt was present on but certainly not in the beef...meh. The Preparation: While the menu board proclaimed that all burgers are cooked Med Rare to Medium, the kitchen staff worked hard to make a liar out of that statement. All three burgers came out a chewy Well Done. The Bun: Whole, freaking wheat...gross. The toasted bun, while moist enough, had a slight flavor of sawdust that one comes to accept in whole wheat breads. The meat to bun ratio was fine, but the meat was weak and the bun was weak so............it was weak. The Cheese: White Cheddar without a trace of Cheddar flavor. It just added a bland, gummy feel to an already chewy burger. The Fries: Crinkle Cuts--crispy on the outside and mealy on the inside...weak. The sliced, Roma tomato that garnished the dish was also mealy....awful. What was shocking and enraging was that this place actually got busy during the 30 minutes that we suffered through this overpriced nonsense on a bun. 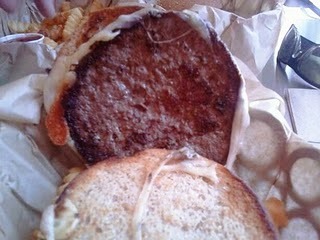 Burger Review : Save the drive and gnaw on a Prius...O!Burger is Certified Crappy and a 100% Bad Value. Yep--wildly inappropriate--dry on top of dry.